We told you earlier this month about Renee Martin, Ramona Watson, and Brenda Eldridge—the mother and two-daughter trio who graduated together in Peirce’s Class of 2015. 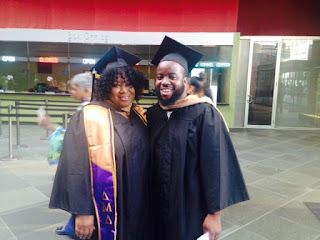 Family ties run through this year’s graduating class in other ways, too: On June 11th, siblings Rahim Bey and Teanna Payne completed their bachelor’s degrees in Business Administration together. Rahim, 27, earned his degree with a concentration in Entrepreneurship/Small Business Management, while Teanna, 39, concentrated in Management. It’s not surprising that Rahim and Teanna majored in the same subject. The two have been close for most of their lives and now have a goal to start their own business together. The duo also told us they had instructors that they felt they could rely on, including Business Faculty Chair Dr. Mike Schirmer. “He is really invested in his students,” Teanna said. Looking back on their experience, Rahim and Teanna have some advice to share for other adult learners earning their degrees. “Time management!” they chimed in together. Now their degrees are the stepping stones they need to move into the next phase of their careers. And it’s family that helped Rahim and Teanna get there. The siblings reflected on their mother at the end of our conversation and told me they wanted to dedicate this blog post to her. “Her choices made us stronger and want more for ourselves and our families,” Teanna said. Congratulations on earning your degrees, Rahim and Teanna! We can’t wait to see what’s next for you!